Product development has always required a tremendous amount of skill from across a broad cross-section of a business. While this remains true today, product managers are facing the additional challenges of an accelerated and ever more complex product development window. Knowing those obstacles it’s critical to have the appropriate strategies for maintaining cohesion and communication across your product design team. To make the most of your design team, this whitepaper by Jama Software will help you and your product manager make the right decisions about organizing your group. 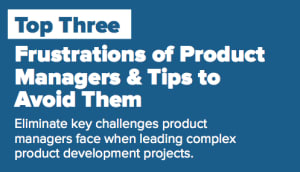 How to better manage complex product development regardless of a project’s scope. How to embrace the accelerating nature of product development and use it to your advantage. How to keep your organization in alignment despite rapidly shifting customer demands. Complete the form on this page to download your free white paper. Your download is sponsored by Jama Software.